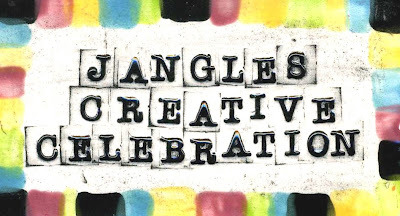 Hey there, here are the official rules to the Jangles Creative Celebration Design Contest. Send me your best jewelry designs using Jangles beads. When the contest closes Jangles will be having a online open house to celebrate and show off all of your creations. The best part, there are prizes! Entries are officially being accepted today and will be accepted until March 27th, 2009. 1. An image of your fabulous jewelry containing Jangles beads. It must have at least one Jangles bead in the piece. It must be your original work which you own the rights to. Pieces can be necklaces, earrings, or bracelets. The image should be a jpeg. and 1000 pixels in either height or width. A neutral background is always you're best bet for photographing jewelry. Don't freak out, this is supposed to be fun. 2. Please include your name, any contact information you would like posted on the blog. Examples, blog addresses, Etsy shops, website...you can't pass up free advertising if you have a business. You don't need to have a business to enter the contest. 3. Materials list for the entry. 4. A bit of background info. This can be either about you, your inspiration, or your design, whatever you feel you would like to say about your piece. You may enter up to three entries, please make sure to send only one entry per e-mail. Incomplete entries will be disqualified. Judging is based on originality, craftsmanship, and aesthetics. Judging will be by me, Jennifer Heynen, and two other non Jangles judges. Once I receive your entry, I will send you a quick e-mail letting you know I have received it. Side note...if for some reason I don't get at least 30 entries for the contest I won't be able to go through with it. It would be a pretty boring night without your designs.